It's amazing how subtle portraiture is. 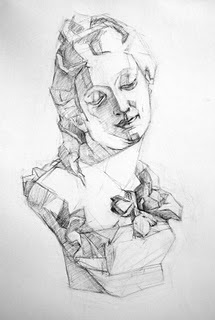 The original sculpture looks like a 17-yr old girl, and somehow my drawing looks like she's about age 22. I have no idea what it takes to shave just 5 years off a face. I'm hoping I can resolve it in the later stages of the drawing, I've done everything I know how to do at this point!